Spidey and Deadpool sitting on a tree, K-I-S-S-I-N-G. If you've always shipped Spiderman and Deadpool (a.k.a. Spideypool), then prepare yourself—because all of your wildest fantasies have officially come true. 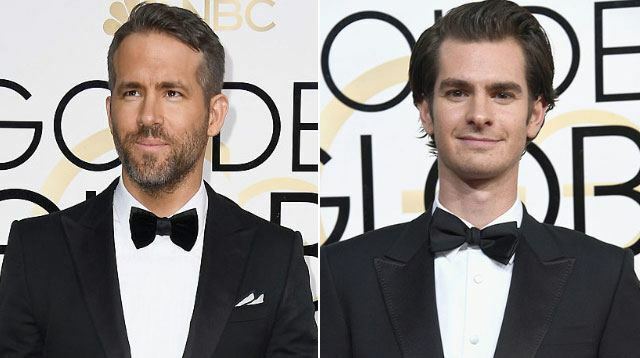 After Ryan Gosling won the award for "Best Actor" over Ryan Reynolds at the Golden Globes, the Deadpool star turned to his neighbor, Andrew Garfield, and grabbed him by the face for a very steamy kiss, which the Spiderman star responded to in kind. Clearly used to her husband's antics, Blake Lively immediately laughed the whole thing off. Meanwhile, fans at home started hyperventilating over a possible crossover movie in which the two run away together and live happily ever after, exchanging sarcastic, douchebag jokes for all eternity.